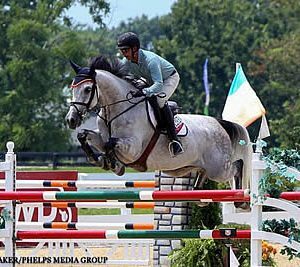 Lexington, KY – July 27, 2016 – Before heading to the Olympics with the Venezuelan team in less than a week, veteran show jumper Pablo Barrios brought his string to the Kentucky Summer Horse Show Series to jump his final classes in preparation for Rio. Despite entering the 8-year-old Stackfleth in the $5,000 Open Jumper 1.40m without expectations to win, Alan Wade’s course proved challenging, producing only three clear rounds. Barrios and Stackfleth were the first combination to go clear, tripping the timers with a blazing time of 62.319 seconds in the speed class. Their lead would hold out for the win, but not before Juan Ortiz and Mavis Spencer would attempt to challenge the quick time. Barrios said he acquired full ownership of the horse two years ago after owning half of him because he liked him so much. Ortiz and the Synchronicity Group’s D’ulien Van De Smeets delivered the second clear round, but were unable to catch the lead. The duo finished in second place after clocking a time of 70.312 seconds. Spencer and Dubai, a Neil Jones Equestrian Inc. entry, were the third combination to go clear, ending on a time of 71.968 seconds to secure the third place ribbon. 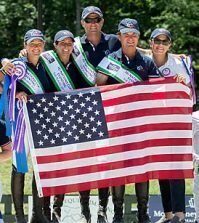 After finishing two weeks at Kentucky Summer, Barrios will head to the Rio Olympics, where he will represent the Venezuelan team with his horse, Antares, and teammate Emanuel Andrade. Earlier in the day, fellow Venezuelan rider Alejandro Karolyi piloted Vinitienne to a first-place finish in the 7-Year-Old Jumpers. Karolyi’s faultless jump-off round tripped the timers in just 34.646 seconds to overtake Manuel Lecuona’s early lead of 35.817 seconds. Venitienne is a fairly new ride for Karolyi, as he acquired the mare at the Winter Equestrian Festival in March. Karolyi cited the mare’s talent and breeding as two of her best qualities. In addition to his victory in the 7-Year-Olds, Karolyi also placed third in the 1.35m Open Jumper division with Isibelle, another talented, up-and-coming mare. The duo was just .2 seconds off the leading time in the tight race for the blue. The victory in the 1.35m Open Jumpers went to Grace Long and Badger Hill Farm LLC’s Gelati, whose time of 37.35 proved unbeatable, despite the top four finishers coming within hundredths of a second of the lead. Second place went to Blythe Marano and Urban, who finished just one-tenth of a second behind Long and Gelati. The jumper action will continue on Thursday with the $25,000 Hagyard Lexington Classic, while other highlights of the week include the $5,000 Hallway Feeds USHJA National Hunter Derby, the $10,000 Under 25 Grand Prix, and $50,000 Rood & Riddle Kentucky Grand Prix. The professional hunter riders enjoyed a beautiful opening day in the Stonelea Ring at the Kentucky Horse Park. To kick off the day, veteran hunter rider Kelley Farmer took home blue ribbons in both over fences rounds of the Green Working Hunter Division. Farmer was aboard Jane Gaston’s KWPN gelding, Because. Though their partnership is relatively new, the duo had a successful winter season in Wellington and have been racking up wins ever since. As the day continued, Tim Goguen topped the leaderboard in the Conformation Hunter Division on Belhaven Stables LLC’s Splendid. The pair won an over fences round and the under saddle, and also placed third in their first over fences round. Goguen, who is based in Lexington, Kentucky for the summer, also placed second in an over fences round with Garland Alban’s Category. The day wrapped up with the High Performance Working Hunters where Sydney Shulman dominated the division by earning blue ribbons in both over fences classes and the under saddle class. 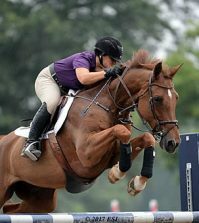 Shulman, who is based in Greenwich, Connecticut, rode Cosmeo, who is owned by DK-USA Sporthorse. Cosmeo left quarantine in March, and this is both Shulman and Cosmeo’s third time competing in a high performance division. 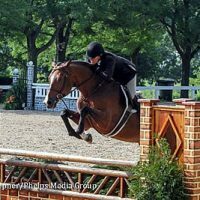 This is Shulman’s eleventh year competing at the Kentucky Summer Horse Show and she enjoys showing all her horses at the Kentucky Horse Park. 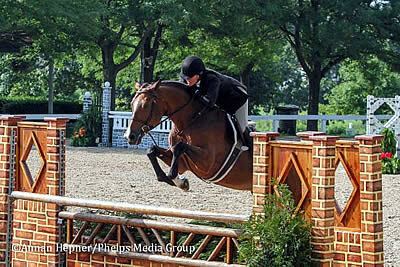 The professional hunter divisions will wrap up Thursday in the Stonelea Ring, with equitation taking place on Friday. 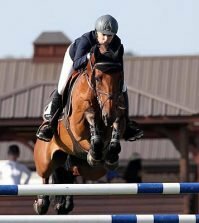 The highlights of the week include the $5,000 Hallway Feeds USHJA National Hunter Derby, the $10,000 Under 25 Grand Prix, the $25,000 Hagyard Lexington Classic, and $50,000 Rood & Riddle Kentucky Grand Prix. 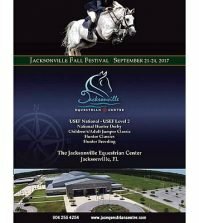 To learn more about the Kentucky Summer Horse Show, please visit www.kentuckyhorseshows.com.